You know you’re playing a game that’s on the high end of the idealism vs. cynicism scale when you literally use friendship to dispel evil. Friendship also fuels your strongest attacks and gets you started on your journey. Almost anything can be done through the power of friendship in Monster Hunter Stories. Just about the only thing it doesn’t do is pay the bills. Pictured: Evil in physical form being dissolved by the power of friendship. You start off as a teenager (possibly preteen?) in a forest with two friends, Lilia and Cheval. They’re talking about becoming Monster Riders, a special kind of warrior who tames fearsome creatures and uses them to fight other monsters. After a bit of searching, the trio come upon a monster egg. This is when character creation occurs—prior to this, the character is shown with a tight hood that hides their hair and most of their facial details. The character creation interface allows for a great amount of detail—both genders, any skin color from the palest to the darkest, many different styles for hair and eyes in every color and shade imaginable. However, you can’t change the character’s height or apparent age—you’re locked into playing as borderline-pubescent kid. But really, that’s par for the course with JRPGs. Lloyd Irving, is that you? Shortly after character creation (and a one-year time skip for spoilery reasons), you start out in your home village preparing to complete the trials required to become a full-fledged Monster Rider. Here in Hakum Village, you’ll find humans living together with a race of sentient talking cats known as Felyne, familiar faces for fans of the main Monster Hunter games. These adorable creatures include every conceivable cat-related pun in their speech, which makes me, a pun connoisseur (punnoisseur? ), love them even more. The elderly village chief, Omna, will point you in the right direction as you set off to complete the Monster Rider trials, as will a veteran Rider named Dan. One of the Felyne, named Navirou, will tag along with you to offer advice. Despite sharing the first four letters of his name with a certain infamous tutorial character, Navirou does not overdo the instructions and actually manages to be quite charming. Shops for armor, weapons, healing items, etc. Despite the game’s name, if you’re expecting a deep and compelling narrative, you’re going to be disappointed. The game’s plot is neither unique nor particularly engaging, and your character has no agency whatever, not even basic dialogue options. Despite that, the named NPC characters are all enjoyably quirky and help to give the game personality. Perhaps the strongest storytelling element in this game are its visuals. For a game on the aging 3DS hardware, this game has beautiful graphics and even more gorgeous pre-rendered video cutscenes. The game uses a cel-shaded art style and makes excellent use of vibrant colors to depict a variety of environments and creatures. Overall, the presentation is very kid-friendly—even when human characters are in conflict with each other, they never attack each other directly, instead relying on their monsters to fight other humans for them. But despite that, it never comes across as overly juvenile. 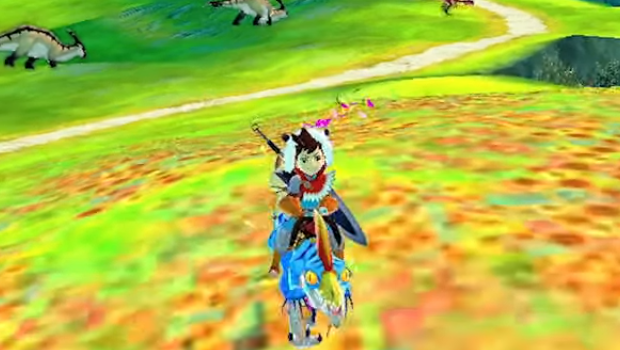 Unlike many JRPGs, there are no random encounters in Monster Hunter Stories. You can see monsters in the overworld and choose to avoid them. Some will give chase, while others will allow you to pass unhindered. If a monster comes up behind you, they’ll get the drop on you and take the first turn in battle, whereas normally you would get the first turn. The fact that you have the option to intentionally avoid battles is a huge time-saver when you’re traveling across the same area multiple times, as you do early in the game. Still, your first few quests can feel a little slow at times, to the point where I was sure I’d put in at least 10 hours after less than a third of that amount of time. But if you can get through that, you’ll meet the Catavaner, who owns a fast-moving vehicle which can instantly take you to any Catavan Stand you’ve previously found. Offering a fast travel ability early on is an excellent game design choice for a world as large as this one, and it’s a great help to the pacing of the game. It also encourages the player to explore by making wandering less of a time commitment. The Catavan: The quickest and cutest way to travel the world. One of the core elements of the system is a rock-paper-scissors battle mechanic wherein Power Attacks beat Technique Attacks, Technique Attacks beat Speed Attacks, and Speed Attacks beat Power Attacks. Your character and a friendly monster teammate can both attack, while the enemy attacks either you or your monster. Some monsters (whether on your side or against you) will always use the same type of attack; others vary their attacks in a certain pattern. A key part of the strategy is to decipher the enemy monster’s attack pattern and counter with the right attack type at the right time to achieve an advantage. You don’t get to choose what type of attack your monster uses, only your own. If you and your Monster both use a type of attack that has an advantage, the enemy may not be able to attack at all, and you and your monster will strike in tandem to deal a huge damage bonus. Additionally, fighting well allows you to gain Kinship Points, which fuel certain special moves that you can choose to have your monsters use, such as debuffs or area attacks. When you have enough Kinship Points, you can ride your monster instead of fighting at its side, which gives you additional offensive and defensive bonuses, as well as the ability to attack together. If you continue to gain Kinship Points, you can unlock a Kinship Attack, a move which varies by monster but is virtually guaranteed to be devastatingly powerful. Full disclosure: I’ve actually never played a Monster Hunter game before. I do know that the RPG style of gameplay is a drastic departure from previous action-based entries in the series, and I happen to have a strong affinity for it. So longtime Monster Hunter fans may have radically different opinions from mine, but for what it’s worth, I’ve found this game to be full of wholesome fun. It’s hardly unique in gameplay and story, but what it lacks in uniqueness it makes up for in execution and presentation. Kyle is an unashamed longtime Nintendo fanboy. Some of his earliest and fondest memories are of playing Super Mario Bros. 3 on the NES with his grandmother. His favorite series are Fire Emblem and Metroid. Outside of gaming, Kyle is also a serious Whovian, favoring the Seventh Doctor and Ace as his preferred Doctor and companion. He also loves superhero movies, power metal music, and basically anything in the space fantasy genre. Avatar by Smashley (@LucinaDanger on Twitter).